Heat a very large pot of water (large enough to fit all of the potatoes, sausage, corn and seafood). Season with Old Bay. Add the potatoes and sausage to the water. Cook for 10 minutes. Add the corn and the crab, and cook for another 5 minutes. Add the shrimp and cook just until they turn pink (a few minutes). Remove from the heat. Arrange the contents of the pot on platters or simply dump onto a newspaper-covered table. Top with lemon quarters. This entry was posted in Recipes and tagged crab, shrimp on December 9, 2018 by The Yellow Pine Times. Recipe Notes: Heavy cream could be used as a substitute for the coconut milk. 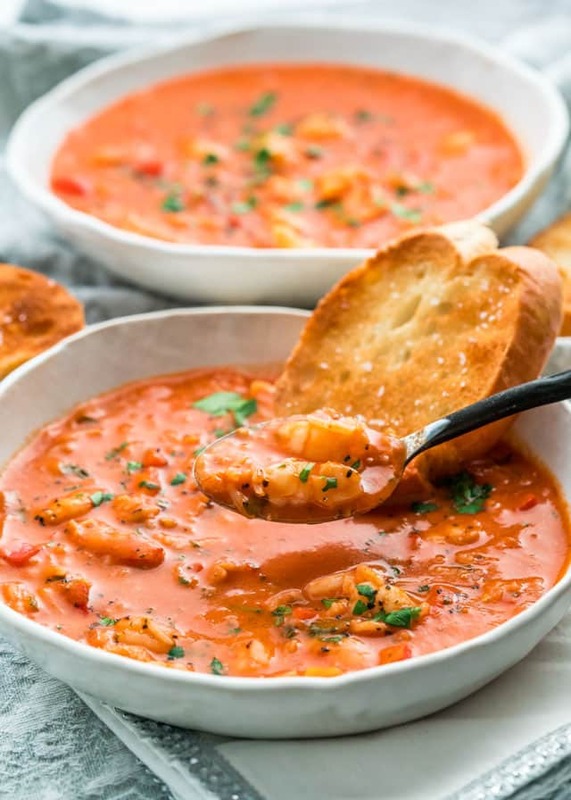 This entry was posted in Recipes and tagged shrimp, soup on July 22, 2018 by The Yellow Pine Times. Mix the garlic, olive oil, tomato sauce and red wine vinegar together in a large bowl. Season with basil,s alt and cayenne pepper, mix in the shrimp until well coated. Refrigerate covered for 30 to 60 minutes stirring once or twice. Thread the shrimp onto skewers, piercing once near the tail and once near the heat and discard the marinade. Preheat the grill on medium heat and spray with some oil. Cook the shrimp for 2 to 3 minutes per side and serve immediately. This entry was posted in Recipes and tagged shrimp on May 27, 2018 by The Yellow Pine Times. Author’s Note: Juicy, perfectly cooked prawns/shrimp bathed in a creamy garlic sauce piled on top of cheesy potatoes with a side of steamed asparagus, all cooked in a foil packet. This method of cooking retains all the prawn juices and it also drips down onto the potatoes, basting them with the best stock ever. Feel free to add more veggies, just as long as they are chopped to steam in 10 – 12 minutes. Grill these on the BBQ, bake them in the oven or even cook these on the stove. Bring a large pot of water to the boil. Add potatoes and cook for 5 minutes or until just cooked. Drain potatoes, then sprinkle with salt, pepper and thyme. Toss to coat. Preheat oven to 200C/390F (standard) or 180C/350F (fan/convection) or BBQ on medium high with hood down. Tear 4 18″ pieces of heavy duty foil (Note 2). Divide potatoes among foil sheets. Top with cheese, then prawns and asparagus, then drizzle over cream sauce. Serve immediately – do not leave them sitting around inside the unopened packet, the prawns and asparagus will overcook and leech water, making the sauce watery. 1. Asparagus – Break or cut woody ends off asparagus (woody ends will break of naturally), then cut in half. 2. Cooling the sauce thickens it (because of the butter) so when you pour it over the prawns, it coats it more thickly. That way when you open the packet, there is cream sauce on the prawns. But it is fine to skip the cooling because you will want to squidge the prawns in the cream sauce pooled at the bottom of the foil packet anyway. 3. Heavy duty foil is available at supermarkets and it is slightly thicker than normal foil. It is insurance to avoid the foil packet from leaking. You could use paper inside the foil if baking, or a double layer of foil. Or live dangerously and risk it with a single piece of normal foil! Do not use paper if cooking this on the BBQ – it will burn. 4. Raw prawns hang straight, cooked prawns form a “C” shape, overcooked prawns curl tightly into an “O” shape. Take a peek to ensure prawns are cooked – they should not be translucent, they should be opaque. 5. 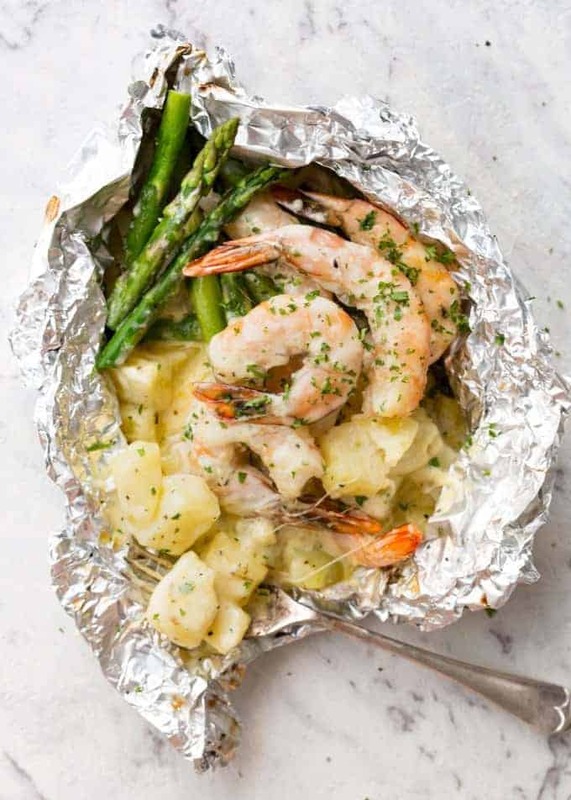 Other Veggie Ideas: Anything that will cook in 10 minutes inside the foil. Thinly sliced carrots, frozen corn or peas (thaw them so they don’t bring down the temp of the packet), broccoli (split in half lengthwise), finely sliced fennel, onion, baby or normal spinach (bunch them up on one side), pumpkin or sweet potato instead of normal potato (cook them per recipe), green beans, quartered brussel sprouts. 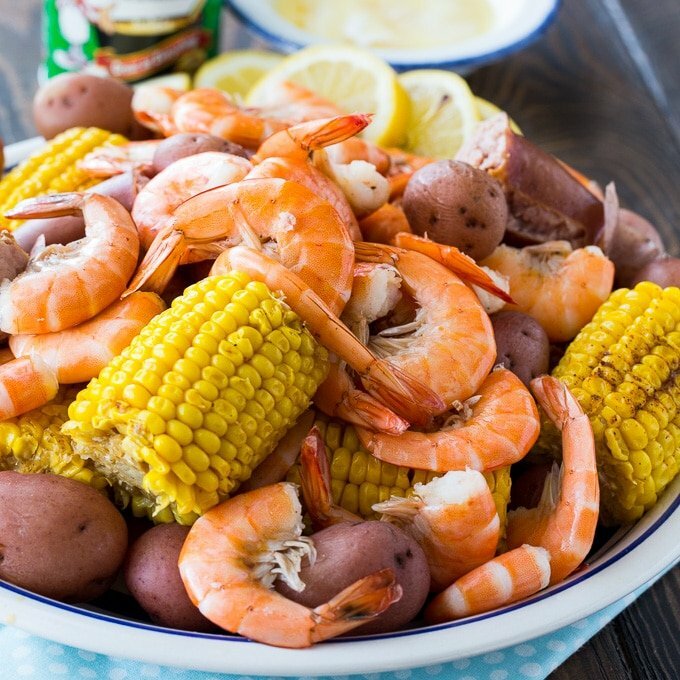 This entry was posted in Recipes and tagged shrimp on May 13, 2018 by The Yellow Pine Times. Add the rest of the ingredients to oven safe skillet, stir and let simmer for 5 to 10 minutes. Remove skillet from the heat and let cool for a couple minutes. Add the shrimp and toss it around so that it’s fully immersed in the sauce. Cover with foil and refrigerate for at least 30 minutes to 4 hours. 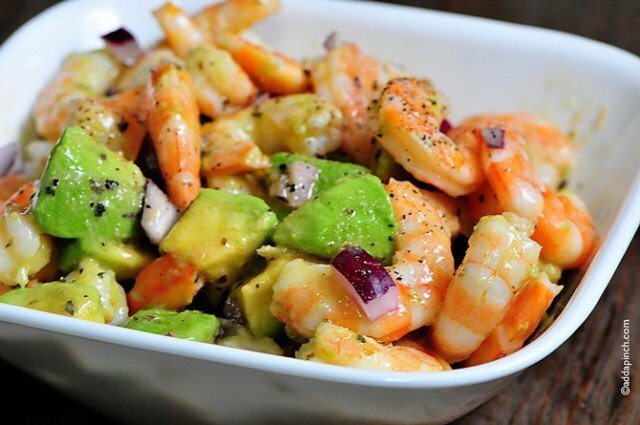 Bake shrimp for 10 to 15 minutes. This entry was posted in Recipes and tagged shrimp on May 6, 2018 by The Yellow Pine Times. * A mirepoix is diced vegetables, cooked for a long time on a gentle heat without color or browning, usually with butter or other fat or oil. This entry was posted in Recipes and tagged sausage, shrimp, soup on April 22, 2018 by The Yellow Pine Times.